We’ve got lots of news to share today. We’ll be doing some travelling at the end of May and we hope we’ll get to meet up with some of you. We also have three new tutorials on the Skin Editor. Read on! This year’s IVRPA conference will be held in the remarkable city of Tokyo, Japan and we will be there! 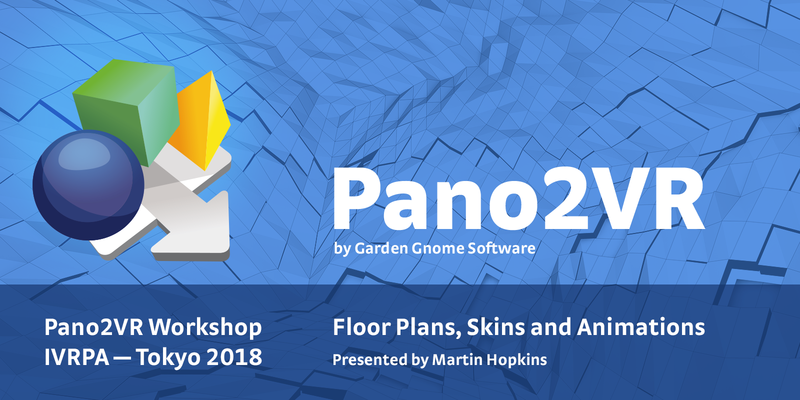 Join Martin Hopkins for his workshops as he shows you how to work with the latest features of Pano2VR 6. He’ll be going over the Tour Map, how to apply and work with floor plans, working with the Animation Editor, and of course the Skin Editor. We will also be in attendance at the Street View Summit in San Francisco. Martin (aka Hopki) has produced a few tutorials showing some of the new features introduced in Pano2VR 6. These tutorials assume you already have some working knowledge of the Skin Editor. If you’re unfamiliar with the Skin Editor, you can learn the basics here. The Skin Editor does require a small learning curve, but once you learn it, you’ll understand how incredibly powerful it can be. Placeholders got updated. They are more efficient and can now be made for variables. Here, Hopki shows us how to dynamically change a URL and text in a Text Box or Button. It’s now easier to create universal skins so that you can build a single skin that can be modified for different projects without having to open the Skin Editor. Check out the tutorial to learn how to create such a skin and to apply the different elements of a skin to an HTML5 output. Action filters are conditions applied to actions. If an action has a filter, then it’ll only get executed if the condition is true. In this tutorial, Hopki shows us a few examples on how to use them.